Introducing the WUWT CO2 Reference Page | Watts Up With That? While the Pause in Earth’s temperature continues, currently 17 years and 10 months based upon RSS satellite data, it is important to note that Fossil Fuel and Cement CO2 emissions are at their highest levels ever. I reject the conclusion that human beings are the source of any of the CO2 in the atmosphere. The source of the carbon in the CO2 is fossil fuels. The source of the carbon in fossil fuels was prehistoric plant matter, and the source of the carbon in prehistoric plant matter was the atmosphere. Man burning fossil fuels is but a very small part of the age old natural carbon cycle. Man is simply facilitating getting the CO2 back into the atmosphere, whence it came. Obfuscation nation. Where is your *fraud* page?! I reject the conclusion that human beings are the source of any of the CO2 in the atmosphere. While I agree with your statements in general, the above statement would mean that none of us exhales. Respiration produces CO2 and is exhaled into the atmosphere. the more I learn about Climate Change.. the more I realize that increased warmth and CO2 concentration are a net benefit to the planet…. Go over to Skeptical Science and ask them about this and they will say, I kid you not, that humans don’t breathe out CO2. Thanks to “Just the Facts” and WUWT for being an aggravator…oh, I mean aggregator of all this data, references and information, After being to a third party and all ( All of the data is linked from third party sources. ) it’s great to come here for some recovery and interesting reading. What bothers me is despite the “pause” and the empirical evidence contrary to AGW the media hasn’t let up one bit and the warmists are getting away with continuing their hoax. You would think by now the average person would suspect a flaw in AGW and tell the emperor he isn’t wearing any clothes. Yes…. but the carbon came from our food…and the food all goes back to plant matter….and the carbon in the plant matter came out of the atmosphere. I object to the smokestack photo in the Carbon Scene chart showing dark smoke entering the atmosphere. Carbon Dioxide is invisible…as well as odorless and tasteless. That picture implies a great inaccuracy often thrown at us by Al Gore et al when they talk of tons and tons of carbon entering our atmosphere each day as a result of the activities of mankind. Gore etal show the smoke stacks because a cement truck is not as scary. To further make the point please show a scatter plot of CO2 emissions version temperature over the last 17 years… you will see a complete shotgun with no correlation Rsquared =zero.zero. Steve Goddard has noticed something interesting: “…the relationship between atmospheric CO2 and the magnitude of USHCN data tampering” shows a 1:1 correlation. Politicized climate science is just the means to promote an undemocratic global government. They don’t care if CAGW/UNFCCC is true or not. They only care about dressing CO2 up as being “the belief in the ‘end of history’” etc. it’s a propaganda war against nations and the individual. If we were to consider a breakdown of the estimated amounts of carbon dioxide emitted into the atmosphere each year from the oceans, volcanic activity, animals, rotting vegetation, bacteria, etc., it would demonstrate that the number of giga tonnes of carbon dioxide emitted by human activity (i.e. burning fossil fuels; land use; etc) is quite insignificant. To therefore just pick on human-activity carbon dioxide, tweaking it by just a small percentage, in the belief that this will miraculously prevent global average temperature rising by 2 degrees and, in turn, halt climate change and prevent future climate catastrophes, well… that is just unscientific nonsense. Yet look at some of those who honestly believe this nonsense… individuals like President Obama, Prince Charles, Al Gore, and David Suzuki. What else can we expect from such people when we see the likes of Obama lecturing us with “the science is settled” and Prince Charles preaching a “CO2 tipping point” in a few more years resulting in doom for us all. Such statements make such individuals appear dumber than they look! But at least we can excuse Obama, Prince Charles, etc for their ignorance. They are just stupid when it comes to climate science. We cannot, however, excuse the various science academies around the world for their role in promoting dangerous man-made global warming, and allowing themselves to be used as a tool of politics and the environmental movement. Organisations like the Royal Society have thus brought science into disrepute. And that is a damn shame! So I have two questions on the CO2 data. 1. The Fossil fuel and cement emissions CO2 graph shows a clear dip in anthropogenic CO2 production in the 2008-2009 time frame as the world’s economies contracted during the Great recession. But if man-made CO2 is driving the majority of the atmospheric increase, why did this dip not show up in the Keeling curve (the Mauna Loa measurement)? 2. 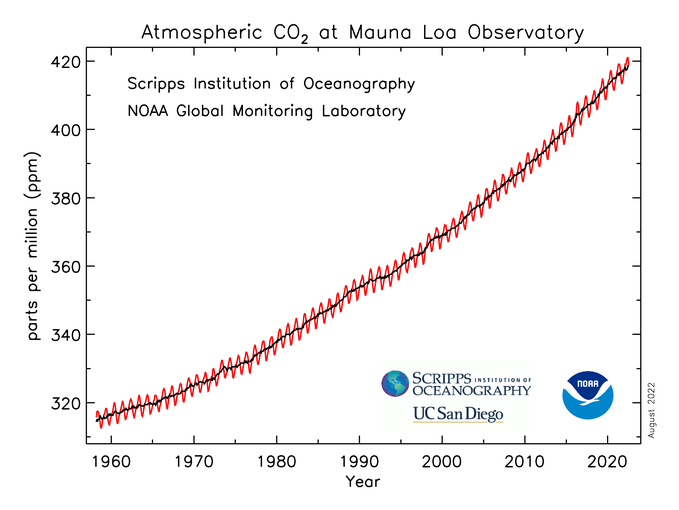 The precision Keeling curve CO2 measurements at Mauna Loa started in 1958. If CO2 is actually lagging temperature rise with some delay, meaning CO2rise is an effect not a cause, then the global temperature rise is causing CO2 to increase. Likely culprits could include thawed permafrost breakdown/decay and/or ocean outgassing. IF the previous statement is true, then the CO2 levels should start to level off soon if Global temps are stabilizing or even decreasing. Has anyone predicted a CO2 rate decrease or leveling? If so, are they making credible, verifiable hypotheses? One thing that is too often overlooked is the variation of CO2 with latitude. Too much obsession with MLO as global “average”. While it is accurate to describe it as “well mixed” it is not totally homogenous world over. The annual variation at Arctic stations like Alert , Canada is much larger than at MLO. If you want a CO2 ref page it should include a broader view than just Mauna Loa data. There is a strong dependance of magnitude of annual swing with latitude. You’ll find the data source in the text. First time I see the cummulative CO2 emissions graph, I was more familiar with the Mauna Loa one. Thanks for the reference page. Obviously, there is no correlation between CO2 levels and temperatures. Big emmisions started in the fifties, first temperature increase started in the thrties. Then temperatures drop (before adjustments were made) while emissions levels keep accelerating, then temperatures raise again, and now the pause. I don’t see any correlation. My reading of Holdren is that he probably regrets saying that on the record. PS Schauinsland , near Freiburg in Germany is very similar to Alert. Timing of CO2 at high latitude closely resembles changes in ice area, for much of the year. 1. The year by year change of human emissions in general is less than 0.2 GtC/year (except for the recovery year 2009-2010). As about 50% of all human emissions (as mass, not original molecules) stay in the atmosphere, the change is less than the accuracy of the detection method used world wide, including Mauna Loa which is around 0.2 ppmv. Further the year by year by year natural variability is about +/- 1 ppmv, which makes that the small variability from human emissions is non-detectable. I agree. It is also pretty poor linking to photobucket copy of the graph, in addition that you loose the links to sources that way. I would suggest reposting it here without the smoke stack photo which is propaganda and not science. Better still find the data source from that paper and plot it youself without the BS. The just link to the source data and don’t mention thier little “carbon project”. If the variation was caused by the ocean surface / ice cover, the CO2 changes and δ13C changes would parallel each other. If caused by vegetation, CO2 changes and δ13C changes are opposite, as is the case here. Maybe an additional plot of temperature + cumulative human emissions + CO2 increase in the atmosphere gives a nice overview of what causes what? The “dip not show up in the Keeling curve” because there is no direct relationship between anthropogenic CO2 emissions and rise in atmospheric CO2 concentration. In some years almost all the anthropogenic CO2 seems to be sequestered and in other years almost none. This is why the UN Intergovernmental Panel on Climate Change (IPCC) uses 5-year smoothing of the data to obtain a fit between the predictions of its Bern Model of the rise in atmospheric CO2 emissions and the Keeling Curve. The Bern Model assumes the atmospheric CO2 would not change in the absence of the anthropogenic emission and the anthropogenic emission is overloading the ‘sinks’ of CO2 so CO2 equivalent to about half the anthropogenic emission accumulates in the atmosphere. Some data smoothing is justifiable. 2-year smoothing is reasonable because data from one year may be accounted to an adjacent year, for example; because an emission is not reported until a subsequent year. And 3-year smoothing is reasonable because countries may not use the same date to start their accounting year. But smoothing of more than 3-years is not justifiable. The IPCC uses 5-year smoothing because less smoothing of the data fails to obtain a fit between the predictions of its model and the Keeling Curve. One of our 2005 papers provides a credible, verifiable hypothesis of the cause recent rise in atmospheric CO2 concentration as measured at Mauna Loa since 1958. (ref. Rorsch A, Courtney RS & Thoenes D, ‘The Interaction of Climate Change and the Carbon Dioxide Cycle’ E&E v16no2 (2005) ). I don’t know if the recent rise of atmospheric CO2 concentration (as observed at Mauna Loa since 1958) has a natural cause, an anthropogenic cause, or some combination of anthropogenic and natural causes, but I want to know. But I do know that the rise is NOT a simple accumulation of CO2 in the air as a result of the anthropogenic CO2 overloading the sinks for CO2: the dynamics of the seasonal variation of CO2 refute such accumulation. Considering the dynamics of the seasonal atmospheric CO2 variation (see e.g. here), it is easy to see that the natural CO2 sinks on the planet can cope with all the CO2 produced naturally and anthropogenically. The seasonal variation has a saw-tooth form. It plummets as net sequestration occurs then rapidly reverses. There is NO reduction to sequestration rate as sinks fill: clearly, the sinks do NOT fill. However, the annual rise of atmospheric CO2 is the residual of the seasonal variation of atmospheric CO2. So, although the dynamics of the seasonal atmospheric CO2 variation clearly show that the sinks could sequester all the CO2 of a year, the annual rise shows they don’t. These observed effects are explicable as being a result of adjustment towards changed equilibrium state of the carbon cycle system. The seasonal variation is response to processes with short (i.e. minutes, hours, days, months) rate constants, and the annual rise is response to processes with long (years, decades, centuries) rate constants. If this explanation of the recent rise in atmospheric CO2 is correct then there are several possible causes of the altered equilibrium. The anthropogenic CO2 emission is one possible cause but the temperature rise from the Little Ice Age (LIA) is more likely. Please note that by using this assumption we were able to model the rise in atmospheric CO2 concentration as being caused by a variety of effects both natural and anthropogenic. Each of our models matches the Mauna Loa data to within stated measurement accuracy for each year. The good fit of each our models with the Mauna Loa data contrasts with the poor fit of the Bern Model used by the IPCC: the Bern Model requires unjustifiable 5-year smoothing of the data to obtain agreement with the data. This need for this unjustifiable smoothing is not surprising because the Bern Mode assumes the CO2 sinks are overloaded when it is clear that they are not. Our assumption of adjustment towards altered equilibrium of the carbon cycle predicts that the rate of rise in atmospheric CO2 concentration should reduce in response to the ‘pause’ at some time after the onset of the ‘pause’ and probably ~30 years after that onset. PS Ferdinand Engelbeen disagrees all of this and I anticipate his arrival to say why. Oh! I see he has while I was typing. Thanks mucho grande, Ferdinand. That is the best info I have seen on CO2 relative to temp change. I will investigate and keep reading literature and research. No. You use a circular argument to obtain a value, make an erroneous assumption, then reach an unjustifiable conclusion. The “temperature effect on CO2” is not known with any accuracy but you assert it is 4-5 ppmv/°C short term (seasons to 2-3 years) up to 8 ppmv/°C (decades to multi-millennia). Your values derive from a circular argument but – for sake of argument – I will here accept them because I think they are ‘in the right ballpark’. The “temperature effect on CO2” is predominantly an effect of biological activity (on land and in the oceans). And biological activity was not the same in the LIA as now. So, the only thing we can say with certainty about recovery from the LIA is that nobody knows the effect of temperature rise from the LIA on the equilibrium atmospheric CO2 concentration. I have not independently checked the data, but I have seen it posted many times that about one third (may be 30%) of all manmade CO2 emissions have taken place since the pause began (some 17 years 10 months ago), and yet there has been no increase in temps. This is a startling statistic given what is claimed about TCR as well as ECS. So it is not only the the temp response that one would expect to see as a result of the addition of some 30% of all manmade CO2 emissions that is not being observed today, but also the long term forcing that some claim is built into the system as a consequence of the CO2 emiitted during say the 50 year period between the late 1940s and the late 1990s that is not being observed. Some warmists are reluctantly acknowledging the pause, and some are even contemplating that there may be no resumption of warming for quite some time. Recently, the UK Met Office has suggsted that there will not be a resumption to warming for 5 years. Perhaps more significantly, their chief scientist said that there may be no resumption to warming before 2030. Now we are already today in a postion to assess what a continued pause through to say 2019 or for matter 2030 may say with respect to climate sensitivity, since we are able to project the BAU CO2 emissions during that further period. It is too early in the morning for me to do the matts (especially because of a late night before), but if the pause continues through to 2019 probably about 40% of all manmade emisssions will have taken place during such pause, and should it continue through to 2030, probably about 80% of all manmade emissions will have taken place during such pause. And should there be a slight fall of temperatures during the next 5 to 15 years, this will push the commencement of the pause backwards, with even more startling consequences. Even today, the observational data is beginning to suggest that climate sensitivity is modest (no more than just over 1), but should the pause continue through to 2019, that data will suggest that the climate sensitivity is less than 1, and shoudl it continue through to 2030, then it will suggest that it is considerable less than 1. In fact, I would not be surprised that should the pause continue through to 2030, especially should there be a fall in temperatures between now and then (even if modest at just 0.1 to 0.2degC through to 2030) which will push back the commencement date of the pause, assessment of climate sensitivity based upon observational evidence will suggest that climate sensitivity is about 0 +/- a little bit, say 0 +/- 0.3. To admit these things, will essentially require them to admit that the claims for alarm were false, and there is no way that the IPCC will hold up its hands and say that we got it wrong. So they will quietly disappear saying that their job has been done, with the current drive towards renewables we are satisfactorily controlling the problem, just keep up the good work. Sorry that I’ve said this before – but to newcomers, this may be of interest. Why does the above ‘WUWT CO2 Reference Page’ again not include the countless additional ways that humans ‘manufacture’ (or add) their 3.225% CO2 to the 96.775% of naturally occuring CO2? It’s not just about fossil fuels and cement. There must be an enormous amount of anthropogenic CO2 emitted by other sources. Sadly, no one has added it all up. Global Alcoholic Beverage Market: (CO2 fermentation) Brewing Industry (Beers & Lagers), worldwide Wine & Champagne production, Beer Dispensing (man-made canisters of CO2) and Distillation processes. Food Manufacture Worldwide: This includes . . . . The World’s entire Bread Production (fermented pockets of ‘air bubbles’ are man-made CO2). Estimated value of the world’s annual CO2 emissions just from bread alone is 85.5M tonnes. Sodium Bicarbonate (Baking Powder) – Aeration used in snack-food industry, biscuit & cracker manufacture and all cakes & sponges. CO2 Induced agricultural poly-tunnels, greenhouses & germination rooms. Fermented Soya Bean (for soy sauce, tofu, etc.). Modified Air Packaging (MAP) CO2 is injected into most food packaging to extend food life & prevent oxidisation. Dry Ice (used to keep fruit & vegetables fresh and essential for freeze drying). Refrigeration: Most (but not all) refrigeration gas is based on man-made CO2, This includes Air-Conditioning in vehicles, homes, shops, offices & aircraft. Industrial Processes: This includes . . . . Sand Blasting Processes (highly pressurised pellet’s of frozen CO2 replaced sand and water in the mid 1970’s. This process is also used by large scale bakeries to clean down equipment more efficiently than just using water & detergents). Canisters of highly pressurised man-made manufactured CO2 @ 150 psi are used in . . . . Stage, Film & Theatre: Dry Ice (used to create smoke effects on set) and CO2 Cannons (as used in stunts for film and TV to propel & topple vehicles). Other Uses: These include . . . .
Cremation: Taking one hour to cremate every 7 stone (100 lbs) of body weight, a casket containing a deceased person is placed in an oil or gas fired furnace which generates temperatures of 870oC to 980oC. All human tissue (except bones) evaporates. The remaining bones (3.5% of original body mass) are ground into ashes. The cremation process generates man-made CO2 from the fuel used for heat, the incinerated casket (usually wood) and the combustion of human remains. According to the Office of National Statistics, of the 493,242 registered deaths in the UK in 2010 alone, 360,066 people were cremated (73%). and, yet, despite all this, the whole CAGW swindle continues . . . .
I’m sort of reluctant to say this as it has been drummed in to me that “CO2 is a pollutant,” but I’m looking at the Cumulative CO2 Emissions graph and I see that over the last 15 years or so that CO2 emissions have just gone through the roof. CO2 is supposed to cause such deleterious warming, but… …there’s nothing. Skyrocketing CO2, but as far the temperature: crickets. Silence. Zilch. No change. It took me several readings through your post, but I think I got most of what you said. Seems quite honest to me. Will ponder, write down some notes and research further. Thanks for the time it took to write that out. I am in much appreciation that what you say and what Ferdinand says may be in opposition. But that is science. I am an immunologist by training, but I have degrees in (BS) civil engineering (soil mechanics) and (MS) electrical engineering (control systems feedback, and statistics of noise in feedback control) and a PhD in human immunology-virology. What you wrote and what Ferdinand wrote, both makes sense. This is what often occurs in science debates. The beauty of internet blogs. It was much appreciated to both Ferdinand and Richard. Everyone on this thread should consider the points Richard and Ferdinand make here on CO2. For me, the bit slow of comprehension, can someone tell me in numbers the (current) total weight of the atmosphere, the total weight of CO2 in the atmosphere and the weight of the human contribution of CO2 to the atmosphere, please ? Sorry for the bother. I just like to have “easy figures” as talking points. 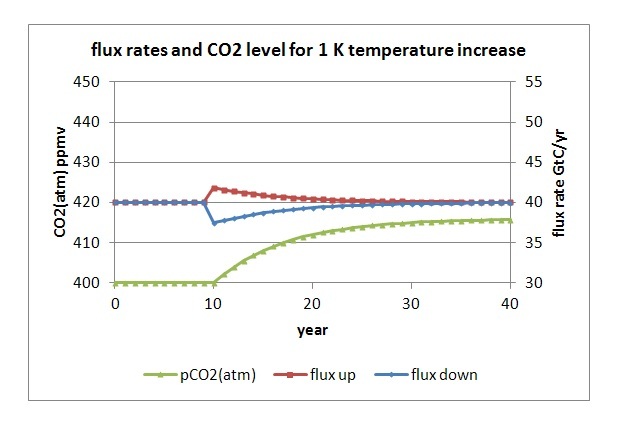 Ferdinand Engelbeen (August 3, 2014 at 1:07 am) posted a useful plot dealing with CO2 and temps (see http://www.ferdinand-engelbeen.be/klimaat/klim_img/temp_co2_acc_1900_2011.jpg ), however, when considering the temp data post the 1960s, one should not overlook two important points. Second, the satelitte temperature data set does not show a linear temp rise since 1979, but rather a one off and isolated step change in and around the Super El Nino of 1998. It may well be the case that since the late 1960s, there has been little warming, and just some step changes in response to EL NIno conditions. If that is the correct interpretation of the data, then climate sensitivity, if any, to CO2 will be small indeed. I can now erase the folder “CO2 graphics” from my bookmarks. Thanks for the imput. Maybe I should have said that there is no correlation between human CO2 emissions and temperature change. Anyway, I despise the term ‘CO2 sink’ when applied to trees and other living organisms. It sounds like Starbucks greennie newspeak to me. A real environmentalist or biologist should never refer plants as ‘sinks’ They are living beings, for Pete’s sake, and they should be grateful that the more carbon we liberate from fosil fuels and spew to the atmosphere, the faster and higher plants will grow, and the more animals will be fed with those plants. The real sink is carbon trapped in fossil fuels. Referring plants as CO2 sinks is part of their propaganda war. War they are winning despite they are wrong. Just one thought. 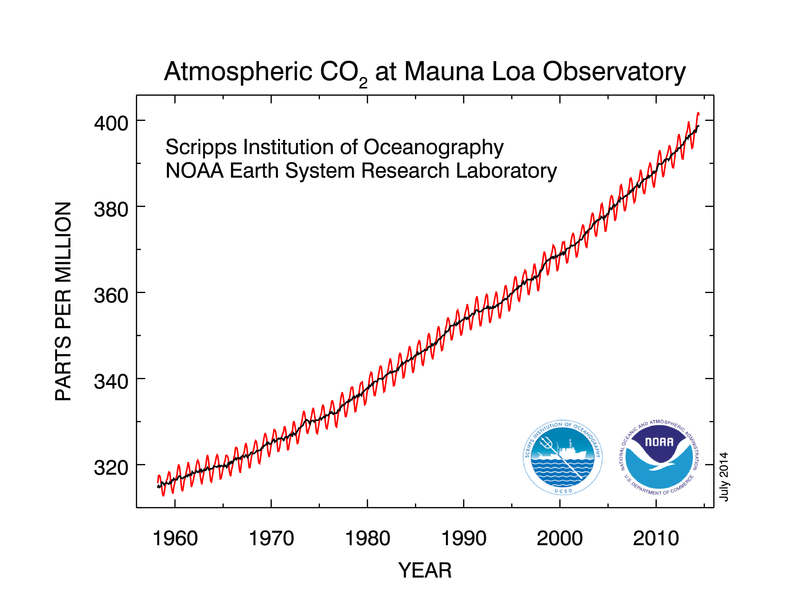 Why does the CO2 graph go up so steadily and remorselessly? Economic activity and thus productive output crashed in Russia in 1990, and their CO2 emissions would have dropped considerably. If CO2 concentrations are mostly man-made, then why do we not see that signature in the Mauna Loa CO2 graph? China emerged in 2001 as a major power-house of the world economy, rising in stature to eventually pump out more emissions than anyone else. If CO2 concentrations are mostly man-made, then why do we not see that signature in the Mauna Loa CO2 graph? We had a major economic crash in the West in 2008, that effected most of the world, and the slow-down in economies and world production was easily measurable. If CO2 concentrations are mostly man-made, then why do we not see that signature in the Mauna Loa CO2 graph? The evidence appears to suggest that CO2 concentrations are not primarily man made. Or if they are, then there must be a smoothing mechanism that has not been fully explained thus far. I know that the sea acts as a CO2 reservoir, but surely it cannot smooth out the fluctuations of mankind, if mankind is truly the primary source of atmospheric CO2. Sadly, no one has added it all up. CO2 from beverages, microbes, insects, animals, humans is all directly or indirectly from plants: they only emit CO2 which was captured by plants out of the atmosphere some months to years before. That doesn’t count for human emissions, as that is part of the natural cycle. Any discrepancy between amounts captured by plants and released by plant decay and food/feed can be detected via the oxygen balance: plant uptake of CO2 releases O2, plant decay and food digestion needs oxygen. The relationship is clearly and quantitatively shown in this plot of total anthropogenic CO2 emissions, including land use, with total air carbon in Gtons. There is an explanatory post here. There wasn’t really a dip in global CO2 emissions in 2009; they were the same as in 2008. Numbers from 2007-2010 were 8543, 8749, 8740, 9167 Mtons C from fossil fuel. re your post at August 3, 2014 at 2:37 am. I refer you to my above post at August 3, 2014 at 1:14 am which is here. I think that most of the commentators act as science is settled the opposite way of IPPC. I don\t know if we should sleep so well with this huge amount og CO2 emission. There is a global warming (in oceans), and there is a TOA radiative imbalance. The long term consequenses are unknown. We need more and better science. In 20 years I think we see the results of this experiment. The year by year variability in rate of change is caused by the temperature (and precipitation) influence on changes in CO2 release/uptake in the tropical forests (El Niño, Pinatubo), but that effect lasts only for 2-3 years. Thankyou for your post at August 3, 2014 at 2:45 am. As I said, there is no direct relationship between anthropogenic CO2 emissions and rise in atmospheric CO2 concentration. In some years almost all the anthropogenic CO2 seems to be sequestered and in other years almost none. And I am aware that – as your links show – assumptions can be made to adjust the data so there is an apparent relationship between anthropogenic CO2 emissions and rise in atmospheric CO2 concentration. Your links assume the discrepancy results from land use changes which are not – and at present cannot be – adequately quantified. The underlying issue is that so little actual data is available concerning the complex carbon cycle that almost anything can be assumed and modeled (as is shown by our paper which I referenced). The day/night fluxes of plants are enormous (some 60 GtC in/out), the seasonal fluxes too: again some 60 GtC in and out over the seasons, but the ultimate storage is currently not more than 1 GtC/year. Sorry Richard,	but the 5 ppmv/°C is what is really measured today as the global CO2 change for a global temperature change of 1°C over the seasons. Mainly a NH effect as there is less temperature and CO2 change in the SH. Nothing circular about that. The 4-5 ppmv/°C can be deduced from the year-by-year variability peaks (1992 Pinatubo, 1998 El Niño). Again direct measurements, no circular reasoning. The 8 ppmv/°C is from ice cores over the past 800,000 years. I do know that you don’t like ice core CO2 data, but I don’t see any reason to distrust them, as ice cores formed under extremely different conditions of temperature and accumulation rates show the same CO2 levels for the same average age. And the same CO2 / temperature (proxy) ratio for each glacial/interglacial period 100,000 years back in time. 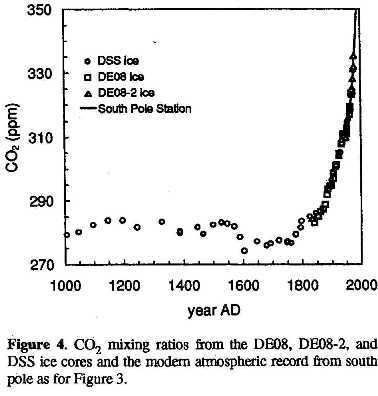 If there was any measurable diffusion of CO2 in the ice, the ratio would fade out for each period further back. Since it has been known since the late 19th century that carbon dioxide absorbs infrared radiation, why wouldn’t the next logical research step be to go out and measure the infrared radiation and quantify the amount coming from CO2? The wave length that CO2 absorbs and radiates has been known for some time. Was such research ever done and is the data available? I found no mention of this in the IPCC reports, but I might have missed it. Since the CO2 in the atmosphere was measured at Mauna Loa since 1958, why wasn’t similar research done to measure the affect of CO2? All I have been able to find is spectrographs showing infrared radiation vs. wave length which highlights bands for different greenhouse gasses for a specific time, but nothing showing change over time. Does such data exist? I would expect that someone would have thought of doing this type of research. Dr. James Hansen, having gotten his degrees at the University of Iowa under James Van Allen and having studied the atmosphere of Venus based on infrared radiation, would have had the background to initiate such as study. Whoever labeled CO2 a ”Greenhouse Gas” has no idea how a greenhouse works. This is BASIC physics. For a gas to ”hold heat” it MUST be a poor emitter of IR. CO2, along with the other misslabeled gasses is a good emitter, as soon as it adsorbs IR it emits IR. Not good for heat retention. That heat mostly radiates to space that which does reach the surface cannot increase temperatures because that radiation does not have enough energy to do so. (see Planck’s Law). There are two gasses that do fit the bill, oxygen and nitrogen, both of which are poor emitters. CO2 it not the problem NASA is. Anthropomorphic CO2 emissions are way below in the list of producers. Top is the oceans, followed by volcanoes, insects, soil, then human production. The list is produced by NASA. I hope the Heartland Institute, or some other U.S. based organisation, will be pressing for a judicial review of temperature data adjustments made to the USHCN database. Can I just clarify, you are saying 60 GtC in/out in 24h period? Where does that figure come from? Not saying you are wrong but not having seen it before it is rather surprising. Indeed, there is more supposition, assumption and bias confirmation than real data. Like so many areas of climate “science”, the answers are determined in advance and data rearranaged to fit. The “carbon cycle” is one huge handwaving exercise. “completely parallels ” sounds impressive until I look at the graph. Then I realise that “completely parallels ” does not really what it sounds like it means. In fact, what does it mean, scientifically? The divergence problem was more that UHI and was not proof that the entire temperature record was faulty in that temperatures were truly falling not rising. What Briffa’s data clearly showed is that tree rings are not a reliable temperature proxy. That is why Mann removed them and padded then end of the bit he kept with something else, even though valid data existed. There may be a legal problem with that. climatechangedispatch.com used to be climatechangefraud.com . I assume that the change was forced. The site also had a “No Al Gore” symbol that is no longer there. Accusing an individual or group of fraud is very serious and, even if you are right, and even if you win the eventual court case, the lawyer fees could break you. “completely parallels ” sounds impressive until I look at the graph. Did you look at his second graph, showing almost perfect linear association between CO2 appearing in the air and emissions? It’s even more parallel if you include land use CO2. I have similar graphs here. No, there is very simple real data. 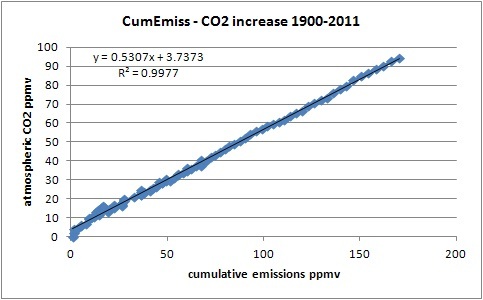 Just measured CO2 and emissions. Emissions account for the CO2 rise. You have ?? I’m still seeing smoke stacks. Also see my earlier post, I provided the _true_ source for the graph, not a photobucket link ! “Click the pic to view at source” Photobucket is not the source ! That heat mostly radiates to space that which does reach the surface cannot increase temperatures because that radiation does not have enough energy to do so. Completely refuted already over 100 years ago by the famous Tyndall experiment. CO2 traps IR radiation in certain bands and can distribute the energy on neighboring O2 and N2 molecules. That depends on the average times before reradiation and the possibility of a collision. 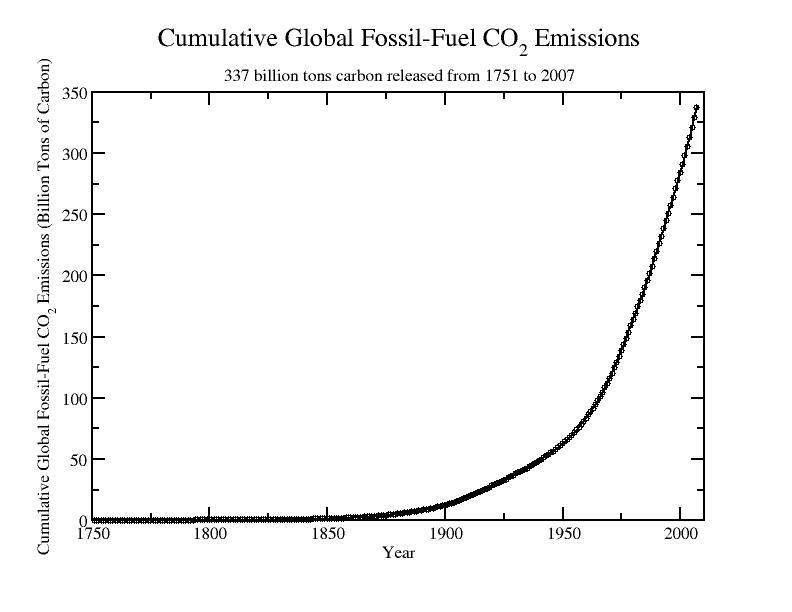 I would recommend a plot of man-made CO2 emissions, atmospheric CO2 concentrations and global temps starting (ideally) in 1750, all on the same graph. but there is a small error in it: I zeroed both emissions and increase in 1900, but should have used an offset, as part of the increase and emissions were already from before 1900. A huge temperature change over halve the scale has little effect in CO2 levels, but the long term change should give 100 ppmv change? I don’t get it – My initial take is that Goddard is either being sarcastic with his “This post is not a joke, but is stunning” or is taking himself way too seriously. Then Tallbloke chimes in with “The aberration around 385-390ppm is interesting. You don’t suppose NCDC were trying to exaggerate the 2010 El Nino do you?” and I’m not sure if he’s jumping on the bandwagon or is just trying to point out a reason to not take things so seriously. I think it’s just some stray coincidence. If you’re going to find some false correlation, I suspect straight line one are easiest to match. It’s replaced on the reference page, but not replaced on this post. I suggest keeping it here for historical accuracy and less confusion while reading the comments. Sorry Richard, but the 5 ppmv/°C is what is really measured today as the global CO2 change for a global temperature change of 1°C over the seasons. Mainly a NH effect as there is less temperature and CO2 change in the SH. Nothing circular about that. The change over the seasons is the short term variation from processes with short rate constants of days, weeks, and months. The change from the LIA is from processes with long rate constants of years, decades and centuries. You assume that only the processes of the seasonal variation affect long term changes, and then you apply the effect of only those processes to supposedly show that longer term processes are not involved in long term changes. A more circular argument than that is not possible! And you apply the same circular argument to obtain the same result from short-lived effects of volcanism. It is not consistent for you to ignore the effect of processes with long rate constants that will have effects over much longer times. And you admit the processes with long rate constants do have some effect because you say the seasonal and volcanic indications are 4-5 ppmv/°C but the ice core indication is 8 ppmv/°C. Of course, as the stomata data indicate, whatever variation the ice cores indicate must have been much higher than the ice core indication. And among the several reasons for this is the mixing during ice formation which has similar effect to conduct of an 8-decade running mean on the data. Nobody knows the effect of temperature rise from the LIA on atmospheric CO2 concentration, and much more information and understanding of the carbon cycle are needed before the effect can be quantified. The data is not simple, because the global atmosphere is not simple. It is a myopic view to think the entirety of the atmosphere is static except for human contribution. Emissions account for the CO2 rise? Finding a simplistic correlation is not the same as understanding relationships which is the necessary basis for so definitively declaring cause and effect. It’s not a stray coincidence. It’s another in the endless series of plots showing that USHCN adjustments (mainly TOBS) increase with time. CO2 in that range also increases monotonically with time, so adjustments increase with CO2. Of course, SG refuses to calculate the adjustments right. He subtracts the average of one set of stations from that of a different set, and so folds in the fact that places being interpolated are increasingly warmer places. But if he did it right, there would still be some correlation. The same applies to people asking if temperature correlates with CO2 increase. It’s the same question as asking if it increases with time. Which, of course, some dispute. Wow, we have people here who say CO2 is not a greenhouse gas, and the Keeling curve is not due to manmade emissions because “the natural sinks do not fill.” Hard to know where to even start with this. The Keeling curve goes up relentlessly, despite the economic downturn, because it represents the accumulation of CO2 in the atmosphere, not just emissions in a particular year or two. CO2 is estimated to have a lifetime in the atmosphere of 30-95 years, so while emissions may go down slightly in one year, but are still running near all-time highs, and the curve representing the accumulation will continue to go up. Arrhenius explained the general relationship between CO2 and surface temperatures back in the late 1800s. He believed that human emissions would prevent the next ice age, and in fact would be needed to grow enough food for the rapidly growing population. (Unfortunately this isn’t working out for California.). There really should be a page devoted to him on this blog. Cause and effect is very simple. We find more CO2 in the air because we put it there. On your US Postal charges you forgot to hide the decline. It won’t work unless you use a trick or two. But the relationships are understood, regarding the ocean Henry’s law tells us that the ratio of pCO2 to CO2(aq) is fixed so absent a large change in ocean temperature the correlation is expected. Similarly the biosphere responds to increased pCO2 so when additional CO2 is released into the atmosphere a fairly constant fraction of it is sequestered resulting in the graphs that Nick and Ferninand produced. As I said, there is no direct relationship between anthropogenic CO2 emissions and rise in atmospheric CO2 concentration. Arrhenius was a great scientist who contributed in several fields. I always used to mention his PhD thesis experience in my graduate student classes. The topic of his thesis was the formation of ions in solution which he proposed occurred in the absence of an electric field, his examiners didn’t think much of this and he barely passed (4th class), twenty years later he received the Nobel prize in chemistry for that work! In your post at August 3, 2014 at 6:24 am you dispute that “the sinks do not fill”. They don’t. The matter you fail to (choose not to ?) understand is explained in my post at August 3, 2014 at 1:14 am which is here and explains the matter. For your CO2 page, you might consider adding Figures 1 to 4 from this 2008 paper, which demonstrates that atmospheric CO2 lags average global surface/near-surface temperature by about 9 months in the modern data record. 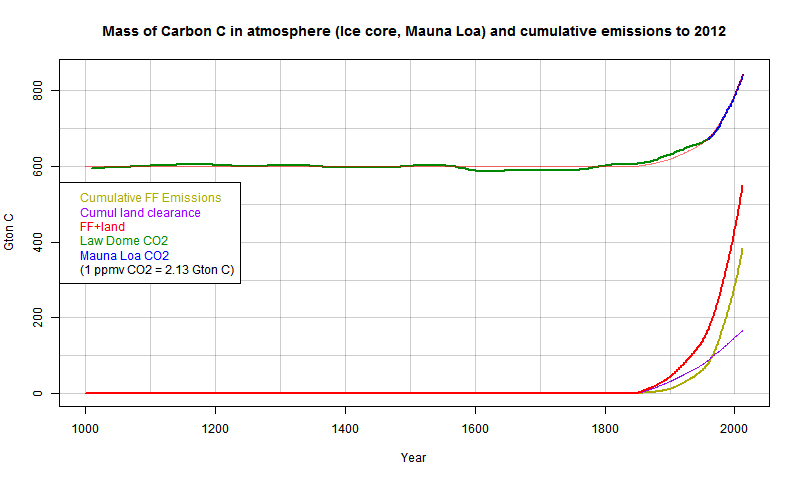 CO2 also lags temperature by about 800 years in the ice core record, on a much longer time scale. I suppose there can be multiple causes of increasing atmospheric CO2, including short-and-long-term temperature change, fossil fuel combustion, deforestation and other land-use changes, etc. However, I humbly suggest that IF atmospheric CO2 is a significant driver of global temperature, it should at least have the decency to precede it in time. The IPCC’s position that increased CO2 is the primary cause of global warming is not supported by the temperature data. In fact, strong evidence exists that disproves the IPCC’s scientific position. This UPDATED paper and Excel spreadsheet show that variations in atmospheric CO2 concentration lag (occur after) variations in Earth’s Surface Temperature by ~9 months. The IPCC states that increasing atmospheric CO2 is the primary cause of global warming – in effect, the IPCC states that the future is causing the past. The IPCC’s core scientific conclusion is illogical and false. There is strong correlation among three parameters: Surface Temperature (“ST”), Lower Troposphere Temperature (“LT”) and the rate of change with time of atmospheric CO2 (“dCO2/dt”). For the time period of this analysis, variations in ST lead (occur before) variations in both LT and dCO2/dt, by ~1 month. The integral of dCO2/dt is the atmospheric concentration of CO2 (“CO2”). He changed tings on the CO2 reference page but not in this post. I see you continue your stalking of me with your comment at August 3, 2014 at 6:37 am. My post at August 3, 2014 at 2:56 am is here. Your stalking and trolling is disruptive. Please return to your playpen. Please, on your sea level data, please live up to your cognomen and present the facts. Instead of facts, you post the data of the notoriously unreliable NCDC and you really should know better. NOAA tidal gauge data shows that sea level on US coasts has been steady, not rising, since before the end of the last century, except where there is subsidence. This data can be extrapolated world wide. Since this is a skeptic site PLEASE do not present data which is contrived for alarmist propaganda purposes, as the NCDC is infamously known to do. PLEASE show some awareness and discrimination in your use of sources, lest you become an unwitting tool of the propagandists. You can study NOAA mean sea level gauge data which is posted on the web for each gauge (there are several score of these situated around the US coasts). Finally, let me caution you against all sea level charts which rely on altimetry data as this can be easily fudged by plotting on a sloped base, as they do at the University of Colorado. While studying NOAA mean sea level plots, focus on the last 20 years of data and do not be lulled by the trend line which is the plot of the last 100 Years or so. Thank you for your efforts here at WUWT. My concern is to help you and Anthony achieve the most accurate and reliable data base in climate science. Sea level data is one area where the alarmists have succeeded in their ruses, and very few skeptics understand this. My hope is that this will change. I stand corrected that the post 1960 data came sourced from Briffa’s data. Everyone knows that trees are not thermometers. Everyone ought to know that their growth response is a response to environmental conditions in general, not specifically to temperature, ie., wide growth shows that environmentat conditions were favourable, narrow growth shows that environmental conditions were unfavourable. It does not tell us why the environmental conditions were favourable and in particular which component and/or components within the environmental conditions were favourable or unfavourable (as the case may be). Don’t forget that the Climategate emails suggest that the Team were alive to the fact that trees were not a global proxy etc. The point I make is that a genuine scientist, not an activist, having discovered that there was a difference between the response between the late 1800s to about 1960 (on which the proxy was tuned), and its post 1990 response had made a discovery of interest. Such a scientist would set out details of the limitations of the proxy data (eg., that the trees are taken from only a small area of the globe and therefore may not represent global conditions more generally, and that they are showing a growth response to environmental conditions generally, not to temperature specifically), but within that limitation and to the extent that trees are considered to be a good proxy for ascertaining temperatures, then the divergence suggested that there were problems with the post 1990 land based thermometer record. Mann could have written a very good paper, concentrating on the divergence issue, what this may suggest, and highlighting why there may be problems in the land based thermometer record. It is probably no coincidence that the divergence problem coincides with rapid urbanisation, expansion of the road network, more affluent central heating and aircon in homes, the beginning of statioon drop outs etc. If he had not been primarily an activist, one might have expected his paper to concentrate on that aspect. Whilst I for one hate all proxies and consider that they should all be taken with a very large dose of salt, it may well be that the tree data is not as bad as one thinks that it would be, in that it is correctly recording that there was little temperature rise in the 70s, 80s and 90s (I have not checked but I think that the data pre dates the 1998 El Nino). This is what the satellite data tells us, namley temperatures were essentially flat in the satellite era up to 1997.. I can appreciate that the source of CO2 may be broken down by separate contributions from burning solid, liquid and gaseous fuels, and removing CO2 from CaCO3 to make Portland, and also into the incidental operations related to liquids production and exploration…but this begs the point. None of this would occur without world demand for energy, which in turn allows for industry, transportation, communication, employment, and so forth. To be blunt, civilization is the root cause of all of this. Now what are we to do about that? However, he has also talked about de-industrializing the West. If you make energy unaffordable, then it follows that you’ve cut off the “lifeblood of the industrial society” and it will die. Seems the statement fits the policy. The top graph in the post confuses me. There are five components in the legend but only four components in the the graphical presentation. What am I missing? Gas flaring is so small it doesn’t show up? “I agree. It is also pretty poor linking to photobucket copy of the graph, in addition that you loose the links to sources that way. Yes, replaced on the CO2 Reference Page, but left in this article for reference. Haven’t had time to read everything but one thing I’d like to see is the lag time between when CO2 level is reached with the human contribution, and when it is reached with the human contribution nulled. Is it a matter of months, years, or decades? Example: When will the volume of “natural” CO2 reach 400PPM? The lag is what our trillions are buying us. 400 ppm of any gas will not raise the temperature of earth’s atmosphere. No slideruler calculations change how insignificant CO2 has been historically. CO2 is nothing more than an artifact of something else that seems not to be understood at any previous point in history. I’d suggest finding charts showing CO2 emissions vs. farm output as well as any other references to the impact of CO2 on crop production. Here’s an example of the effect of CO2 on crops. You assume that only the processes of the seasonal variation affect long term changes, and then you apply the effect of only those processes to supposedly show that longer term processes are not involved in long term changes. A more circular argument than that is not possible! . Richard, you have surpassed yourself in crooked reasoning. I never said or even implied that short term processes are dominant in long term CO2 changes. As far as I remember it is you who every time insists that the residual of the short term variation is what drives the CO2 increase and that the fast move of large quantities CO2 in and out during a few months “proves” that the seasonal processes are not limited but “could” absorb more CO2, but you don’t know why they don’t (my standard answer: because they can’t: they are limited in capacity). What is important is that the short term processes are short term and are not the same processes that make the longer term changes happen. The longer term changes are from extra vegetation growth and vegetation area (NOT from increased diurnal or seasonal cycles) when temperatures increase after a cold period at one side and opposite from the warming of the oceans and/or ocean current changes as result of that warming. The CO2 record shows an increase of 8 ppmv/°C and a slight increase of δ13C with temperature increase over decades to multi-millennia for the sum of all processes involved . Thus the oceans are dominant over those time frames. About the stomata data, we have discussed that before: that are proxies with their particular problems, including the absolute height of the data. If they don’t match the ice core averages over the same time frame as the resolution of the ice cores, the stomata data are certainly wrong. And the increase since the LIA is at maximum 1°C, thus maximum 17 ppmv extra in the atmosphere for seawater, according to Henry’s Law. Minus what the extra plant growth absorbs. In average for all processes together: 8 ppmv/°C. The rest of the 100+ ppmv is from human emissions. Wow, note how postal charges were also affected by El Chichon and Mt Pinatubo ! Clearly a slow down in the rate of increase of postal charges for several years after each event. Richard, I’d be very interested in reading your paper. If you are able to let me have a reprint, please post a message on my about page and I’ll get back to you. Yes, I think it does. Marking the axis in ppmv is confusing, though. It isn’t easy to envisage emissions in ppmv. I never said or even implied that short term processes are dominant in long term CO2 changes. The seasonal variation only last less than a year. Only effects shorter than a year can effect it. The volcanic effects last less than 3 years. Only effects shorter than 3 years can effect it. That is NOT “crooked reasoning”: it is reality. My post quoted your entire post and gave the answer I have given here together with other supporting information and argument. It was at August 3, 2014 at 6:09 am and is here. Frankly, Ferdinand, your post I am answering is beneath you. And what is exposed when arctic ice melts ? Aquatic “vegetation” in the form of phytoplankton. The paper is paywalled and I am now on the Editorial Board of ‘Energy & Environment’ (E&E) so I cannot break the publisher’s rules by giving you a free copy. However, my presentation to the first Heartland conference was on the E&E paper of your interest, and I then provided an accompanying paper which is almost entirely a ‘copy and paste’ from the E&E paper. If you email me at richardscourtneyATaol.com then I will send you a copy of that accompanying paper (which is effectively the same as the paper you want). Ferdinand, there is much empirical evidence showing that ∆T causes ∆CO2. That cause and effect relationship is seen on time scales from years to hundreds of millennia. But there is no comparable data showing that changes in temperature are the cause of subsequent changes in CO2. Charts like this do not show cause and effect, they only show coincidental action. That chart is simply an overlay of T and CO2, without any indication of which leads and which lags. As we see in the charts above, CO2 lags T.
The causation is clear: ∆T causes ∆CO2. But the alarmist crowd insists that CO2 causes T to rise. The real world shows they are wrong, since global warming has stopped, despite steadily rising CO2. The alarmist crowd got causation backward, therefore their conclusion is necessarily wrong. All the evidence shows that ∆T causes ∆CO2. Is there any doubt? I found 8ppm/year/kelvin for inter-annual variation. Note that is a rate of change per K , not a fixed change per K which implies that it is equilibrating on annual timescales. I don’t think that can be justified. There is a lot of doubt that it is a black and white issue. For years now I have been asking anyone to post a chart showing that ∆CO2 causes ∆T. So far, no one has. I would be very interested if you have ever found such a cause and effect between changes in global CO2, and subsequent changes in global temperature. 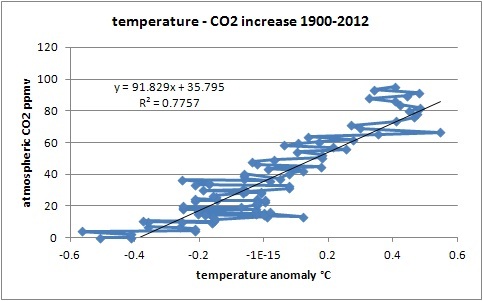 If “there is a lot of doubt that it is a black and white issue”, then post a graph showing that CO2 leads temperature. Please. I’m interested. I don’t see any evidence of lag in that graph. Do you? BTW where is “antarctic ice core data 1” I don’t recall hearing of that core before. I really don’t think you are helping. You’re making the same error again, Briffa was the dendroclimatologist, not Mann, and he did what you are suggesting. From D’Arrigo, R. et al. Yes. Here’s another. And another. Look close. There’s more here. And here is a peer reviewed paper showing that CO2 lags temperature. And another. And another. Six more peer reviewed papers listed here report that CO2 lags T. None show that ∆CO2 causes ∆T. For years now I have been asking anyone to post a chart showing that ∆CO2 causes ∆T. So far, no one has. I would be very interested if you have ever found such a cause and effect between changes in CO2, and subsequent changes in temperature. If there is a cause and effect in that direction it will on a decadal scale. There is so much variability and uncertainty in the SST record that is it not possible to prove one way or the other. Not having a graph to prove it , is not sufficient to refute it. It seems most likely to me that it is a mix of two , probably 50/50 would be my current guess. ie about half of CO2 rise is residual emissions, half is out-gassing. But that is gut feel, not proven. For the record, I have posted nukmerous peer reviewed papers, and charts of empirical data [including one on ‘a decadal scale’], all showing that temperature changes lead changes in CO2. Your response? You have a gut feeling. You need to do better than that. Greg Goodman says: I don’t see any evidence of lag in that graph. Do you? So you can see the 800 y lag on a graph where the scale is in 10^5 years. Good man. I’m not saying the 800y lag does not exist just try to find graphs that show it rather than ones that don’t. The other graphs with shorter time-scales you just showed are fine. Others can see it, too. Try looking closer. 800y is about the thickness of the plotting lines on that graph. With two sets of noisy data, if you think you can detect a lag like that you are kidding yourself ( so are the acclaimed ‘others’). I can see several drops where CO2 stays high for a while. I can equally see several rises where CO2 moves first. That makes eye-balling the graph pretty inconclusive. That’s why we invented maths. I’ve done plenty of work myself showing it is dCO2 that correlates on annual to decadal scales, some of which I’ve linked here. I’m just saying being dogmatic and black and white is not realistic. CO2 will likely be providing a positive feedback during glacial/interglacial transitions. To that extent it is a cause of temp change. Climate is complex and does not lend itself easily to simplistic black/white explanations. That is crooked reasoning: assuming something that I never assumed or implied. I only did show that the measured short term processes give not more than 4-5 ppmv/°C, while the measured long term processes don’t show more than 8 ppmv/°C. The diurnal 60 GtC in/out is over a year and of the same order as the seasonal changes. Although the amounts over a year are huge and locally measurable (especially under inversion: up hundreds of ppmv at night), in general that doesn’t influence the rest of the atmosphere as most night respiration is taken away during the day and the difference is readily mixed in before reaching the remote measuring stations. If we excluded every graph that has questionable adjustments, the Global Temperature and Global Climate pages would be quite barren without HADCRUT, HADSST, GISS, NOAA NCDC and NODC, etc. The University of Colorado at Boulder Global Mean Sea Level Change graph was given a label after “a “Correction” of 0.3 mm/year added May, 5th 2011, due to a ‘Glacial Isostatic Adjustment (GIA)'”, if you can demonstrate specific issues with the NOAA NCDC graph, we can certainly add a label to it. However, unless a graph is demonstrated to be erroneous, e.g. Mann’s Hockey Stick, it is better to include it on the WUWT references pages so that we can readily monitor it and compare it. It is much harder to manipulate data when there are thousands of eyes on it. This is the issue: sea level is not rising. The SL rise on charts like NCDC is bogus. I have already referred you to the NOAA mean sea level charts which prove this. Please read again my comment above and do a little investigation. To shrug your shoulders on thisissue is no way to start out. Do not be a lazy scientist. I have pointed you the way so go to. The 400 ppmv never will be reached naturally, except if the world (ocean) temperature increased some 14°C. If humans stopped with all emissions today, next year the CO2 levels would have dropped with ~2 ppmv, because the current sink rate is 2 ppmv/year, caused by the extra pressure of CO2 in the atmosphere. The following years that will decrease, as the pressure in the atmosphere decreases. That leads to a e-fold decay rate of ~52 years or a half life time of ~40 years of the extra CO2 in the atmosphere. To put CO2 in perspective, here is the concentration in the geologic past [when the biosphere teemed with life and diversity]. Global T did not skyrocket as a result, so the prediction that catastrophic global warming will result from a little more CO2 is falsified. Here is another chart. The biosphere is currently starved of CO2. Adding more is a net benefit. This is the issue: sea level is not rising. The NOAA NCDC graph is global, even if NOAA’s “tidal gauge data shows that sea level on US coasts has been steady”, that doesn’t invalidate the NCDC graph. On what basis do you think that “This data can be extrapolated world wide”? The SL rise on charts like NCDC is bogus. I have already referred you to the NOAA mean sea level charts which prove this. Please read again my comment above and do a little investigation. To shrug your shoulders on thisissue is no way to start out. There aren’t even links in your comment. If you think you have identified an error with NOAA NCDC Sea Level Rise, do your own investigation, post your findings and we will consider them. Do not be a lazy scientist. Just for the irony of it the CO2 page should have the Scripps Institution of Oceanography graph of O2 at the bottom of the page. It’s a near mirror image of the CO2 graph and should inspire a few questions and ideas about what’s happening with the carbon cycle. All the industrial uses of CO2 you mentioned are accounted for. We produce CO2 for industrial use from natural gas. We count natural gas combustion and conversion in CO2 emissions. Industrial CO2 does not come from plants. It comes from natural gas. CO2 from dead people comes from the plants and animals they ate. Whether cremated or not, the carbon will return to the soil and air as part of the natural carbon cycle. Ferdinand, I take exception to your post at August 3, 2014 at 3:32 pm which repeats a falsehood and repeats an untrue assertion that I used “crooked reasoning” to refute your circular argument. I refuted those assertions in my post at August 3, 2014 at 1:57 pm which is here. Ferdinand, making an offensive falsehood is beneath you. Repeating it when called on it is way beneath you. Not quite. If a single large scale vineyard (say in Marlborough, Australia) makes 2M gallons of wine, the additional CO2 manufactured by man in the fermentation process is unnaccounted for in any ’emissions’ figures. The amount of CO2 is approximately double of that if the grapes had just been left to naturally rot on the vines and return to ‘the soil’. If it were the same amount of CO2, I will never need to purchase alcohol again – just eat rotting fruit. Likewise, if I apply half a bottle of ‘Valkial’ limescale remover to my bathroom taps, the additional CO2 manufactured by me is unaccounted for. When I bake bread (using deliberatly germinated yeast) or make a sponge cake, the same applies. Ramp this up to global industrial levels, then it should amount to a significant contribution to anthropogenic CO2 – which again is unaccounted for. Again, it’s not just about fossil fuels and cement. Finally, not all man-made bottled (or liquid) CO2 for industrial processes derives from natural gas. It can be made from hydrogen and ammonia reaction using methane produced during industrial biomass processes for example. Nor should it be. The carbon was from CO2 already in the air, reduced to sugars by the vine. Either you haven’t read that (while you were very active on that discussion) or you are deliberately confusing the reader by fabricating assumptions that I never assumed and explicitly rejected. Tyndall’s experiment had been forseen by Fourier who debunked the GHE (At least in a correct translation) some years before 1824. Heat from the CO2 molecules will only transfer the bulk of their heat kinetically because O2 and N2 are poor IR adsorbers. Look at the Moon, receives the same solar radiation and noon temperatures are 121C shade temperatures -150C. No atmosphere to REDUCE radiation. CO2 lazers are common firstly because they can give very high energies enabling metal cutting and profiling. They are quite efficient, 20%, probably because they adsorbe IR readily. BUT they require a high input of energy to achieve this cutting ability. Low powered CO2 lazers are used for range finding because the bulk of the atmosphere is a POOR IR adsorber. But I am sure you know this as well. I am replying to your post at August 4, 2014 at 2:48 am which is here. No! Ferdinand, this will not do! You repeatedly accuse me of misrepresenting you for saying that. YOUR POINTS 1 AND 2 ARE WHAT I SAID!!! and your point 3 is an unsubstantiated assertion which was also answered in my post at August 3, 2014 at 6:09 am that I have linked from this post. You have made a circular argument and – as I said – you refuse to see it is circular and try to excuse your error by repeatedly falsely accusing me of using “crooked reasoning” to refute your circular argument. I repeat, Ferdinand, this will not do. But there is no comparable data showing that changes in temperature are the cause of subsequent changes in CO2. The temperature drop between MWP and LIA was at least as much as the increase between LIA and current warm period (except if you accept Mann’s HS…). The CO2 drop was ~6 ppmv from MWP to LIA with a 50 year lag after the main temperature drop. The increase after 1850 is over 100 ppmv, hardly attributable to temperature. While the CO2 increase is not caused by temperature, its effect on temperature is debatable, and theoretically not more than 0.9°C for a CO2 doubling before (negative and positive feedbacks). Heat from the CO2 molecules will only transfer the bulk of their heat kinetically because O2 and N2 are poor IR absorbers. Yes, but that means that the atmosphere is warming up where CO2 absorbs its part of the outgoing IR radiation, as long as the possibility of a collision before re-radiation is present. CO2 lazers are common firstly because they can give very high energies enabling metal cutting and profiling. Your assumption of my assumption is not based on anything I did write. That is my final word on this. I am not surprised that you have withdrawn because following much argument about the matter in tyhis thread, at August 4, 2014 at 2:48 am in your post here you admitted that your Point 3 was in another discussion on another thread. I discussed what you wrote and you accused me of things I did not do. But none of this is important compared to the point I made at the start of this fuss; viz. The problem is that plotting direct changes, derivatives and derivatives of derivatives show the same sinusoids, thus direct effect, effect in the derivatives, etc… are all possible. Over all time frames (except the past 160 years), there is a rather fixed ratio between temperature changes and CO2 changes, with very variable rates of change per K for each period (glacial-interglacial transitions and back, near zero during an interglacial,…). Richard, you often say that you don’t know, but want to know. My impression is that you don’t want to know anything that does fit the human cause of the increase in the atmosphere. The effect of temperature on CO2 levels is 8 ppmv/°C over longer term: decades to multi-millennia. That is as scientifically rock solid as can be. That the oceans are the main driver of this ratio is also rock solid, as that can be deduced from the 13C/12C ratio changes over the same time frames. That has nothing to do with any knowledge of the carbon cycle, as what is measured is the final result of that cycle, which is all what counts for the amounts of CO2 in the atmosphere. 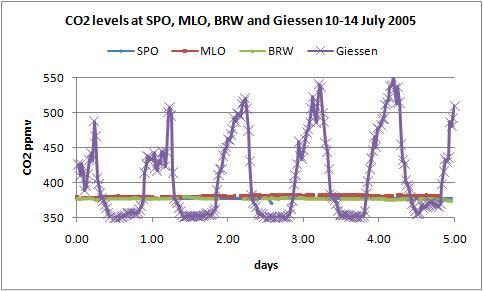 The effect from the MWP – LIA cooling in the 20-year resolution Law Dome DSS ice core is 6 ppmv. The temperature increase LIA – current is quite certainly not more than the MWP-LIA temperature drop. Thus the CO2 increase since the LIA is not more than 6 ppmv. Not the 100+ ppmv which is measured. Is is interesting to me that the cumulative anthropogenic CO2 emissions between 1750-1875 were ~1.2ppmv and the cumulative CO2 increase over the same period was ~12ppmv, so the CO2 accumulation in the atmosphere was occurring at a rate 10 times father than what humans emissions could do. 12ppmv over 125 years of course doesn’t sound a lot but assuming the ice-core data were correct and 1C corresponded to 8ppmv it would imply that the oceans warmed by 1.5C and the paleo-climate data doesn’t appear to suggest that. Just thought I’d put that out there. Well, I don’t know how you could rationally obtain that “impression” because I challenge those who assert unjustifiable assertion on both ‘sides’ of the argument. Your problem is that you create arguments which support your view and ignore all the uncertainties: indeed, with the ice core data you pretend the uncertainties don’t exist! I know you think that but it is plain wrong. It derives from your mistaken idea that the ice cores trap air as though they were – to use your words – sample bottles. THEY DO NOT. The ice core data is proxy data and we know from the stomata data that it is very inaccurate, but we do not know how inaccurate. And your mistake also exists because you refuse to recognise that the system of the carbon cycle would be different in a different temperature regime and we do not know how different it would be. Yes, if one accepts the ice core and the stomata data then the recent increase to atmospheric CO2 began about a century before the anthropogenic (i.e. man-made) emission was sufficiently large to induce the rise. Of itself this does not disprove an anthropogenic cause of the recent atmospheric CO2 rise. However, it does indicate much more natural variability to atmospheric CO2 than is admitted by advocates of the putative anthropogenic cause. Of course, my reply to you should also have acknowledged that the data you mention also provides doubt – as you say – to the atmospheric CO2 vs temperature relationship indicated by the ice cores. The ice core data is proxy data and we know from the stomata data that it is very inaccurate, but we do not know how inaccurate. As I said before: if you don’t like the data, then the data must be wrong. The ice core data are accurate to +/- 1.2 ppmv for the same part of the same ice core and +/- 5 ppmv for different ice cores for the same average gas age. That are direct measurements, not “proxies”, of a mix of CO2 levels of several years, from 10 to 600 years, depending of the snow accumulation rate. That the carbon cycles (and the ocean cycles) are quite different during the LIA than during the MWP is quite sure, but that doesn’t change the fact that the net result is known with reasonable accuracy. The problem is more in the timing of the average gas age, which is influenced by the snow accumulation rate (which gives the modeled firn densification = diffusion rate) than in the measurements themselves. 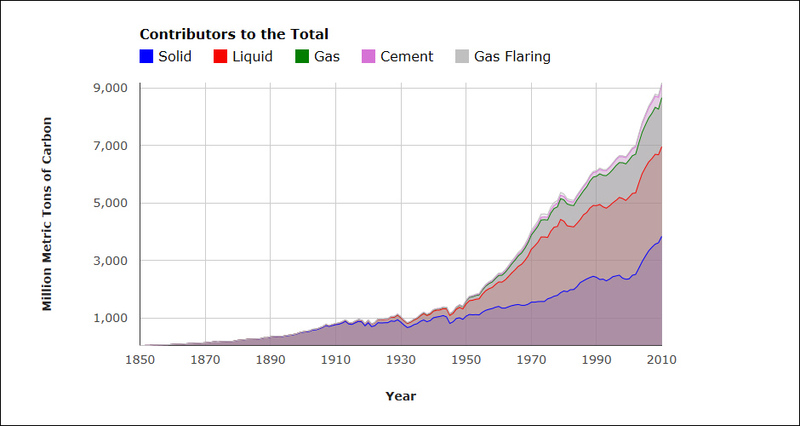 Besides that, the human emission figures are estimated on fossil fuel use, which started mainly after 1850 as industrial use. But human induced land use changes from the past few hundred years are largely unknown. A similar increase of CH4 is also seen in ice cores, without really known reason. Some speculate that rice cultivation was already much larger than expected over a much longer time frame. recently confirmed by the 800,000 years Dome C record. The main deviations from the 8 ppmv/°C trend are from the long CO2 lags after temperature changes during glacial-interglacial transitions (800 +/- 600 years) and worse during interglacial-glacial transitions (several thousands of years). In view of Murry Salby’s assertion that atmospheric CO2 content is not correlated to global anthropogenic emissions, is there a way the relation of annual global emissions to atmospheric CO2 content could be shown on this reference page. So that is merely an overlap of two charts. Overlaps are improperly used to show cause and effect. But they show no such thing. All they show is coincidence, not which came first; CO2 or T. Overlapped charts do not show causality. The charts I posted show very clearly and decisively that ∆T causes ∆CO2. I have asked repeatedly for someone to post a similar chart, showing that changes in CO2 cause changes in global temperature. No one has ever posted such a chart. That is so obviously wrong that all I can do is refer you back to the numerous charts and data that I have posted, showing that changes in CO2 are, in fact, caused by changes in T.
I do agree with your statement that the maximum change in global T would be at most ≈0.9ºC. That is not only nothing to worry about, it would be a net benefit to the biosphere. Warmth is good; cold kills. Finally, you refer to possible feedbacks and secondary effects from CO2. While those are theoretical possibilities, there is no evidence that they exist in the real world. If they did exist, then global warming would not have stopped. CO2 from burning/plants etc uses CO2. Measurement of O2 will therefore show an inverse plot to CO2 concentrations in atmosphere if the CO2 increase is burning based. O2 will change little if CO2 changes are the result of sea temperatures. Most phytoplankton/plants in NH so dip is largest in north. The O2/N2 ratio is continually declining, matching the CO2 increase so burning o2 (inside green plants or inside fossil burners) is outpacing the absorption of CO2 by photosynthesis. Once again, that chart is a simple overlay. It does not show cause and effect. It does not show that CO2 ‘leads’ T. It only overlays coincidental changes. What I am asking for is a chart like this one, which clearly shows that a change in CO2 causes a subsequent change in global temperature. I’ve been asking for someone to post such a chart for several years now, showing where ∆CO2 causes ∆T, but no one has ever produced one. All we are left with, then, are charts showing that ∆T is the cause of ∆CO2. Now, CO2 may have a small effect on T. But if it does, that effect is too small to measure. Otherwise, you or someone else could post a chart showing that a rise in CO2 causes a rise in temperature. But so far, there is no such evidence. Therefore, we must accept the only measurable evidence there is: CO2 reacts to temperature; not vice versa. What I am asking for is a chart like this one, which clearly shows that a change in CO2 causes a subsequent change in global temperature. That plot is only right for the short-term (2-3 years) variability of (tropical) vegetation and says next to nothing about the longer term variability, which is opposite to that one: vegetation is a net sink over longer term. Oceans are the main cause of long term increases. Ferdinand, that is an OVERLAY! It doesn’t show cause and effect. I’m still looking for a chart that shows causation, not one that shows coincidence. 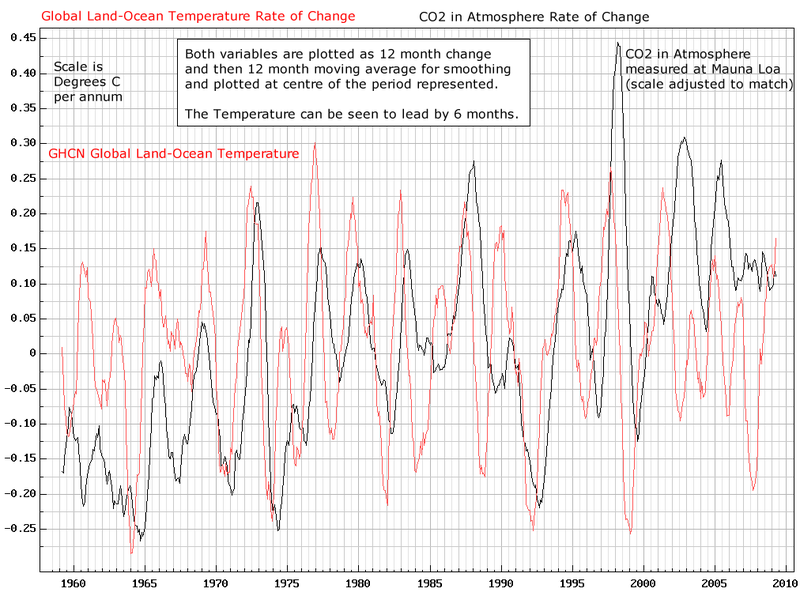 The only charts I’ve ever seen show that changes in temperature cause subsequent changes in CO2. If CO2 causes changes in T, there certainly should be a chart that shows CO2 is the cause. Where is it? Come on db, the increase in the atmosphere almost perfectly follows human emissions, which are twice the increase in the atmosphere. I can’t think of any natural process that will give such a 99.99% correlation that causes the same slightly quadratic increase in the atmosphere with exactly the same timing as human emissions. Certainly NOT temperature as that goes up, down, up, flat while emissions of CO2 and increase in the atmosphere are continuously increasing. Well, Ferdinand, if there is a cause and effect between the rise in CO2 and the rise in temperature, you should be able to find a chart like this showing that T follows CO2. But if all you have are overlays of CO2 and temperature charts, then maybe your conjecture is base on a simple coincidence. In science, stranger things have happened. I’m willing to be educated, and you are good at it. But I need that chart to be convinced. Play around with the WoodForTrees site, maybe you can find something. So far, I haven’t been able to. Everything I’ve found shows that CO2 follows T.
Actually you produce 3 times more CO2 in making wine than just let the grapes rot. You can eat rotten fruits but you will not get drunk with water. The wheat and yeast in your bread get their CO2 from the air and will return to the air. Chemically possible but that’s not how we produce industrial CO2. We can also make hydrogen gas from seawater but we make it from natural gas because it’s cheaper. Correction: 3 times more CO2 in rotting grapes than in wine making. The conclusion is correct: 3 times more CO2 in rotting grapes than in wine making. Everything I’ve found shows that CO2 follows T.
Check this out. 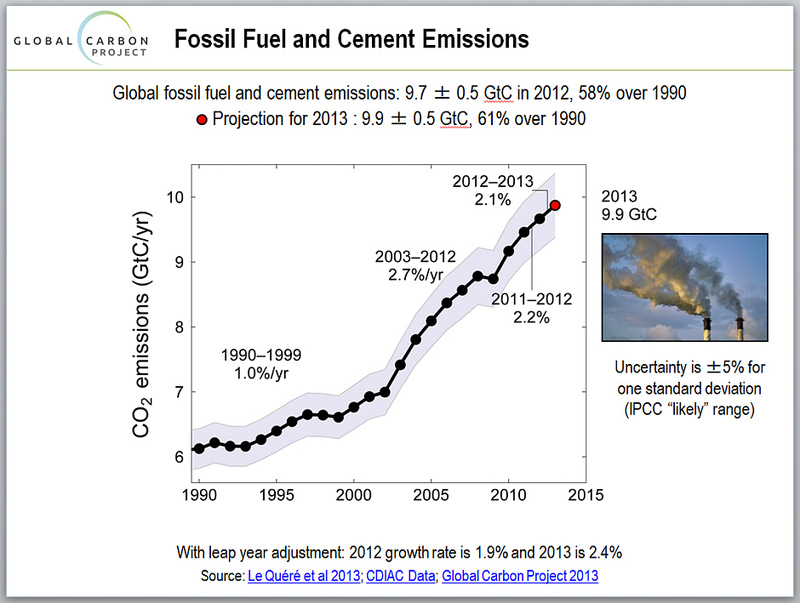 CO2 has absolutely nothing to do with T, but everything to do with human emissions. You have posted a great many graphs supporting your point of view, and I agree with virtually all, however if you expect others to accept the obvious truths in your graphs, I would think that you would also accept the obvious truth in the above graph. What you say applied thousands of years ago with respect to CO2 and T, but not since 1900. I agree 100% with Ferdinand here. I am well aware of the fact that others do not agree, however I remain unconvinced by the arguments of the others. What you say applied thousands of years ago with respect to CO2 and T, but not since 1900. This graph is recent. So is this one. And this one is also “since 1900“. How do you explain those? Don’t they contradict your statement? 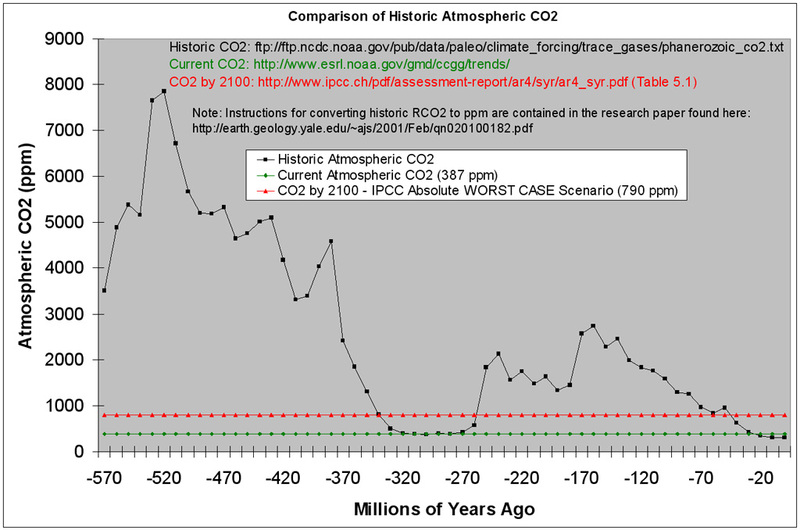 All I want is a similar chart, but one that shows CO2 controlling T.
Still waiting for someone to post such a chart. db, your graphs are about the short term variability of +/- 1 ppmv: peanuts in the 70+ ppmv increase since 1959. Indeed caused by temperature variations, but T has nothing to do with the 70+ ppmv increase in the atmosphere. Your claim about human CO2 production is based on unfounded claims by the IPCC. The US Energy department put it at 3% of total production. But even that figure is based partly on guesswork. We actually do not know. it has been discovered that CO2 produced by FF use is isotopically identical to volcanogenic CO2. So there is no way to differentiate. NASA has also calculated that the Oceans top the CO2 producer list with insects and volcanoes in the list above human FF produced. John, we have been there before: isotopic composition of FF is quite different from volcanic or oceanic releases, but the same as for vegetation. But the latter is a proven sink for CO2. I find the first one confusing since CO2 does not go up since 1980 and no one argues that it did not. So whatever they are trying to show, I do not accept it. Furthermore, the second line in the top graph says: “Since 1980, global temperature change is not being caused by human CO2 emissions”. That is totally different than saying “Since 1980, global CO2 change is not being caused by human CO2 emissions”. OK then, here is a graph with a much longer time frame. Here is another one. I am not disputing your chart, Werner. But it is not an adequate explanation by itself. I also agree with Ferdinand that human CO2 emissions are the reason for the recent rise in atmospheric CO2. But that isn’t my point, and it never has been. I’ve always agreed with that, ever since Ferdinand provided convincing evidence. My point is this: if a rise in CO2 is the cause of a subsequent rise in global T, then where is the evidence? That should be readily available in the form of a chart, just like the other charts I posted are. <—[that chart is clear, unambiguous, empirical evidence showing conclusively that ∆T is the cause of ∆CO2]. But where is a comparable chart showing what you claim? A chart showing that ∆CO2 causes ∆T? The fact that no one can produce such a chart means that there probably is no such evidence available. If there is no evidence to show that ∆CO2 causes ∆T, then that is nothing more than a conjecture. An opinion. An evidence-free assumption. I have no problem at all accepting what you assume. But in order to move beyond a conjecture, you must produce testable, measurable scientific evidence. But so far, there is no such evidence. Has it ever occurred to you that however much sense your conjecture makes, it might possibly be wrong? The history of science is filled with examples of beliefs that were later overturned. The only defense against that is an open mind. My mind is open. Please fill it with evidence. I also agree with Ferdinand that human CO2 emissions are the reason for the recent rise in atmospheric CO2. But that isn’t my point, and it never has been. I agree with you on that point. But on the question of which is the cause, and which is the effect, no one has posted any evidence showing that ∆CO2 causes a subsequent change in temperature. The only cause and effect evidence shows that changes in CO2 are caused by changes in T.
That tells me that the alarmist crowd got causality wrong. They got it backward. So of course their conclusion will be wrong. I can be convinced that I am wrong very easily: just produce a verifiable, testable chart showing that changes in temperature are preceded by changes in CO2; the same kind of WFT chart that you posted in your last comment. That should be very simple to do… IF CO2 is the cause of ∆T. But absent such evidence, I remain skeptical. The only cause and effect evidence shows that changes in CO2 are caused by changes in T.
I have no interest in getting into semantics as to whether or not you accept that human contributions are also a “cause” and higher CO2 is an “effect”. Yes, I agree. But that is entirely different from the statement: ‘changes in CO2 are caused by changes in tempearture, but there is no testable, measurable scientific evidence showing that changes in temperature are caused by changes in CO2′. 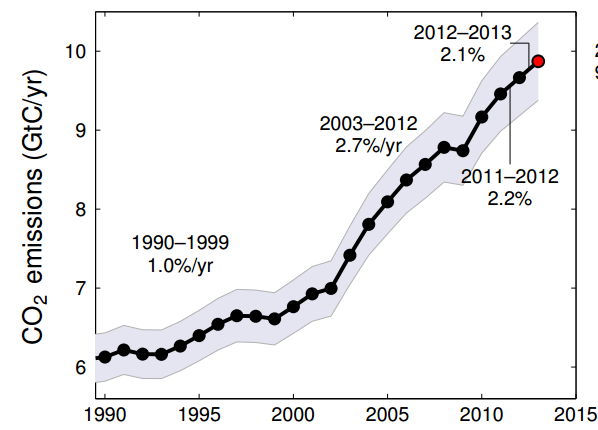 Human activity has caused a rise in atmospheric CO2, from 0.03% to 0.04%. However, global warming has not followed that rise for more than seventeen years now, per the satellite record [or ten years±, if you use GISS or other ‘adjusted’ data]. Do you see the difference? I’m sure you must. You are smarter than most. Ferdinand also sees the difference. He’s no dummy, either. But he has quietly abandoned this debate, because he cannot produce the causation chart I’ve repeatedly requested. So I ask you, Werner, just like I asked Ferdinand: could it possibly be that you’re mistaken about the effect of CO2? All it would take to convince me is a WoodForTrees chart, showing that ∆CO2 is the cause of ∆T. Not just once, or sporadically, but consistently over different time scales, like the charts I constantly post showing conclusively that ∆T is the cause of ∆CO2. This question goes to the heart of the AGW debate. Without measurements, there is no science. Surely you know that better than most. So, convince me. 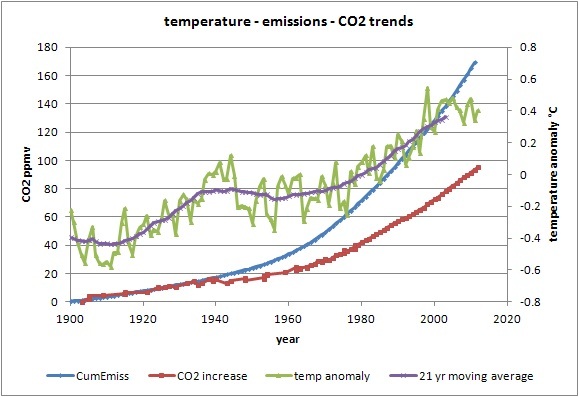 Produce a chart showing the claimed causation; a chart showing that changes in CO2 are the cause of subsequent changes in temperature, on a global scale. At this point, I’ll accept just about any chart you post, if it shows that causation. Thank you for your post and your graph of atmospheric CO2 lagging “global” temperature T by about 800 years over a time scale of several hundred thousand years of recent Earth history. As you know, CO2 also lags T in the modern data record by about 9 months, on a shorter time cycle. It appears that CO2 lags T at all measured time scales. This still allows for other significant drivers of atmospheric CO2, such as fossil fuel combustion, land-use changes such as deforestation, ocean outgassing, etc. There is reluctance of most parties on both sides of the “mainstream” climate debate to discuss the “CO2 lags T” issue. The mainstream climate debate is essentially an argument about the magnitude of equilibrium climate sensitivity or ECS: Warmists say ECS>= 3C or more, which is nonsense; Skeptics say ECS,<= 1C, which is more reasonable but still questionable, in my opinion. I suspect this general reluctance to discuss “CO2 lags T” is a fear of being ridiculed or marginalized. However I suggest it is at the very core of the “catastrophic humanmade global warming” (CAGW) issue. For example, the concept of ECS must ASSUME that CO2 drives T, but does ECS really exist is any physical sense? A) Maybe ECS does not exist at all in physical reality, and we should be discussing the sensitivity of atmospheric CO2 to temperature (let’s call it EC02S). B2) Is it possible that ECS exceeds ECO2S but exists on a fuzzy longer time scale that is difficult to detect in the modern data record? C) Maybe, as was strongly suggested in 2008, ECO2S is a “spurious correlation”. I suggest this notion is no longer considered valid and the correlation is real and significant. To my knowledge, I initiated in early January 2008 the still-heretical notion that dCO2/dt changed ~contemporaneously with temperature and therefore CO2 lagged temperature by about 9 months, and thus CO2 could not primarily drive temperature. I am fairly sure this concept was new because of the very hostile reaction it received from BOTH sides of the CAGW debate. All the warmists and most skeptics completely rejected it. First I was just plain wrong – the dCO2/dt vs T relationship was merely a “spurious correlation”. Then I was grudgingly admitted to be correct, but the resulting ~9 month CO2-after-T lag was dismissed as a “feedback effect”. This remains the counter-argument of the global warming alarmists, apparently the best they’ve got – a faith-based “Cargo Cult” rationalization, in my opinion. Now we are embroiled in the “Mass Balance Argument” as ably debated by Ferdinand Engelbeen and Richard S Courtney, and I frankly think this is quite worthwhile. To me, this is the cutting edge of climate science, and it is interesting. I also infer that some parties, notably Jan Veizer at the University of Ottawa, had gotten almost this far some time ago. Intellectually, I think the alleged global warming crisis is dead in the water, although politically it sails on, a ghost ship with the Euros and Obama at the helm. Not to forget our own Dalton McGuinty in Ontario – now a “have-not province” collecting transfer payments , our national welfare scheme for mismanaged economies. The global warming alarmists have squandered more than a trillion dollars of scarce global resources on foolish “alternative energy” schemes that we condemned in writing in 2002. We said then that “the wasteful, inefficient energy solutions proposed by Kyoto advocates simply cannot replace fossil fuels” and this is now proven to be true. The economies of the European countries and their fellow-travellers have been hobbled by green energy nonsense, and millions are suffering and thousands are dying each winter from excessively high energy costs. I am concerned, I hope incorrectly, about imminent global cooling, which I (we) also predicted in a Calgary Herald article in 2002. I really hope to be wrong about this prediction, because global cooling could cause great suffering. Our society has been so obsessed with the non-existent global warming crisis that we are woefully unprepared for any severe global cooling, like the Maunder or Dalton Minimums circa 1700 and 1800. Solar activity has crashed in SC24, and although our friend Leif Svalgaard says not to worry, I continue to do so. There are many correlations calculated in the spreadsheet. In my Figure 1 and 2, global dCO2/dt closely coincides with global Lower Tropospheric Temperature LT and Surface Temperature ST. I believe that the temperature and CO2 datasets are collected completely independently, and yet there is this clear correlation. 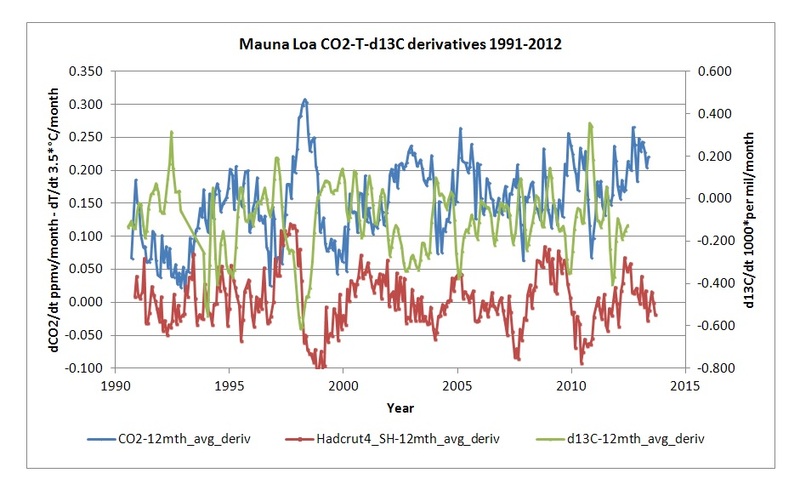 After publishing this paper, I also demonstrated the same correlation with different datasets – using Mauna Loa CO2 and Hadcrut3 ST going back to 1958. Later I examined the close correlation of LT measurements taken by satellite and those taken by radiosonde. Further, earlier papers by Kuo (1990) and Keeling (1995) discussed the delay of CO2 after temperature, although neither appeared to notice the even closer correlation of dCO2/dt with temperature. This correlation is noted in my Figures 3 and 4. This subject has generated much discussion among serious scientists, and this discussion continues. Almost no one doubts the dCO2/dt versus LT (and ST) correlation. Some go so far as to say that humankind is not even the primary cause of the current increase in atmospheric CO2 – that it is natural. Others rely on a "material balance argument" to refute this claim – I think these would be in the majority. I am (almost) an agnostic on this question, to date. It is interesting to note, however, that the natural seasonal variation in atmospheric CO2 ranges up to ~16ppm in the far North, whereas the annual increase in atmospheric CO2 is only ~2ppm. This reality tends to weaken the "material balance argument", imo. This seasonal 'sawtooth" of CO2 is primarily driven by the Northern Hemisphere landmass, which is much greater in area than that of the Southern Hemisphere. 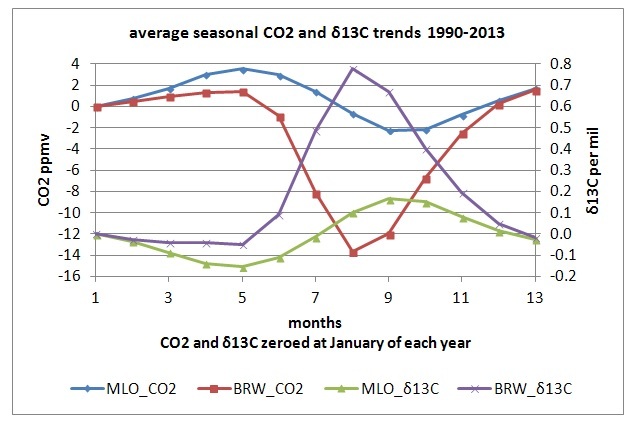 CO2 falls during the NH summer due primarily to land-based photosynthesis, and rises in the late fall, winter and early spring as biomass degrades. There is also likely to be significant CO2 solution and exsolution from the oceans. It is also interesting to note that the detailed signals we derive from the data show that CO2 lags temperature at all time scales, from the 9 month delay for ~ENSO cycles to the ~800 year delay inferred in the ice core data for much longer cycles. In this enormous CO2 equation, the only signal that is apparent is that dCO2/dt varies ~contemporaneously with temperature, and CO2 lags global Lower Troposphere temperatures by about 9 months. 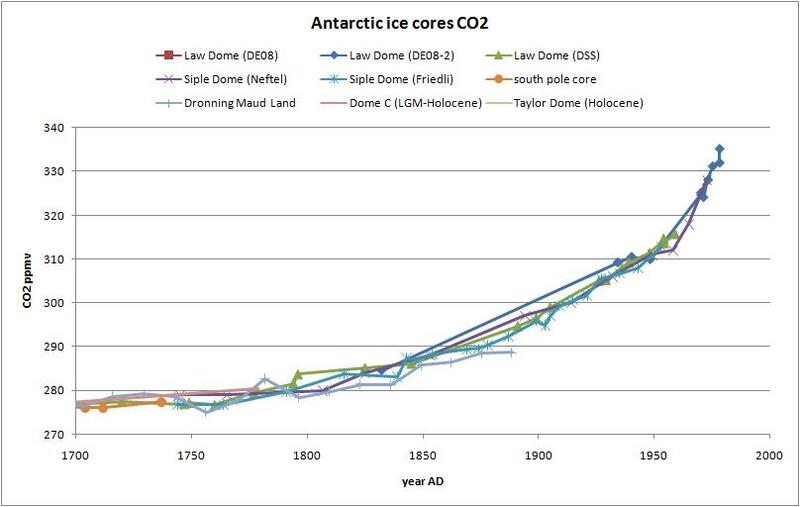 CO2 also lags temperature by about 800 years in the ice core record on a longer time scale. I suggest with some confidence that the future cannot cause the past. I suggest that temperature drives CO2 more than CO2 drives temperature. This does not preclude other drivers of CO2 such as fossil fuel combustion, deforestation, etc. My January 2008 hypo is gaining traction with the recent work of several researchers. We don’t always agree on the fine details, but there is clear agreement in the primary hypothesis. – Changes in global atmospheric CO2 are lagging 11–12 months behind changes in global sea surface temperature. – Changes in global atmospheric CO2 are lagging 9.5–10 months behind changes in global air surface temperature. – Changes in global atmospheric CO2 are lagging about 9 months behind changes in global lower troposphere temperature. – Changes in ocean temperatures explain a substantial part of the observed changes in atmospheric CO2 since January 1980. – Changes in atmospheric CO2 are not tracking changes in human emissions. A paper by a group from three Dutch universities published in Atmospheric Chemistry and Physics that they have found that only about 3.75% [15 ppm] of the CO2 in the lower atmosphere is man-made from the burning of fossil fuels, and thus, the vast remainder of the 400 ppm atmospheric CO2 is from land-use changes and natural sources such as ocean outgassing and plant respiration. Produce a chart showing the claimed causation; a chart showing that changes in CO2 are the cause of subsequent changes in temperature, on a global scale. That is a different issue and one that I cannot prove. The dragon slayers would agree with you though. I am not going to go there at all. Thanks for the detailed reply. It will take me a while to digest it all. I’m glad to see others grappling with this problem. It is an unexplained discrepancy that goes to the heart of the entire global warming / carbon debate. I don’t know about others, but in my view this question has enormous consequences. The argument from the beginning has been that a rise in anthropogenic CO2 will cause substantial to runaway global warming. Why is there no evidence whatever to support that conjecture? The answer is obvious: CO2 just does not have the claimed effect. I am still not willing to say it has no effect. 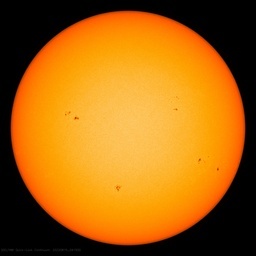 But whatever warming it may cause, it is so minuscule that it is not measurable using current instrumentation. Such a pitifully small effect — if it even exists — completely destroys the alarmist argument. But I would welcome any disagreement, because that way we can get closer to the truth. Thanks for your reply. This is not a ‘dragon slayer’ issue, this is a major discrepancy that must be addressed. Sorry you’re not up to it at present, but if you find a chart that shows that changes in CO2 cause changes in temperature, or if you decide to find the answer as to why there is no such evidence, either one will be welcome. This is major, Werner. And Ferdinand. It cannot be ignored forever. I posted charts confirming what I’ve commented on. But when you say “our charts”, where are they? All I’m asking for is a chart showing that changes in CO2 are followed by changes in T. Is that so hard to produce? Apparently so. And if no such charts exist, then, being a good scientist, you must reassess your original conjecture to take that lack of evidence into account. There is only evidence showing the causation: ∆T causes ∆CO2. The reverse is a baseless, evidence-free conjecture. You must revise your conjecture, Ferdinand. Like a good scientist. Below is the abstract for the aforementioned recent paper by researchers from the Netherlands. CO2 is such a scarce and excellent plant food that it is gobbled up very close to the source during the growing season. In urban environments like Salt Lake City where CO2 is emitted, it is gobbled up so quickly by plants that there is NO DISCERNIBLE HUMAN SIGNATURE IN THE DAILY CO2 RECORD. Recognizing the CO2 is NOT that well-mixed in the atmosphere..
… this may be where the “Mass Balance Argument” (fossil fuel combustion is the certain cause of atmospheric CO2 increases (NOT)) falls apart. Let’s suppose that humanmade CO2 from fossil fuel combustion is quickly gobbled up by plants close to its (usually urban) source. The rest of the world and its carbon cycle just carries on, unaware in every way that humankind is burning fossil fuels. It also may be that humanity IS causing the observed increase in atmospheric CO2, but that increase may be primarily due to other causes such as deforestation, agriculture, etc. Fossil fuel is just a convenient bogeyman – everyone hates the oil companies when they gas up their car – it’s just that the alternatives are worse. Researchers get in Dutch: “…the average gradients of fossil fuel CO2 in the lower 1200 m of the atmosphere are close to 15 ppm”. Citation: Bozhinova, D., van der Molen, M. K., van der Velde, I. R., Krol, M. C., van der Laan, S., Meijer, H. A. J., and Peters, W.: Simulating the integrated summertime Δ14CO2 signature from anthropogenic emissions over Western Europe, Atmos. Chem. Phys., 14, 7273-7290, doi:10.5194/acp-14-7273-2014, 2014.